Recently I found a box of old jeans from the high school days. After reminiscing, I started brainstorming crafts involving jeans. Then the lightbulb hit "4th of July flower headband." 1. Cut (6-8) roughly 2x2 inch jean squares. I like to vary in sizes, for example: 2x3's & 2x2's. This will give the flower a unique look! 2. Place a drop of hot glue in the center of the jean cutout. 4. Push the right triangle corner into the fold to add volume. Don't forget to add glue! Continue and repeat this step to the left corner. 6. Repeat this step 6-8 times depending on how full you want the flower. 7. Cut a circle out of the felt, roughly 2 inches in diameter. 8. Start gluing the backside of the jean flower to the felt. 9. Cut the thin white lace into 1.5 inch strips. 10. Place on the flower petal in a "star shape." Then glue the lace strips down fast! Hot!! Don't burn yourself! 11. Now cut 6 small jean squares (1x1). 12. Repeat the same folding technique . 13. Glue the smaller jean triangle petals onto the flower. 14. Now cut (6) 1 inch red lace strips. 16. Pull off a pearl from the necklace and hot glue to the center of the flower. 17. Take a measurement of your daughter's head or your head and glue the edges together. 18. Cut another piece of felt 2 inches in diameter. 19. Place the lace in between the two pieces of felt and glue like crazy! Show that lace who is boss! Now you have an adorable lace flower headband made strictly in the U.S.A perfect for the upcoming holiday! Happy 4th of July! Thanks for reading, and please let me know if you have any questions. This is cute. I love using scraps. Thanks for sharing. 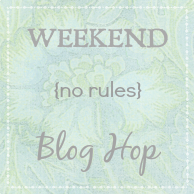 Hello from the Weekend No Rules Blog Hop! This is super clever - I will be pinning this to try! 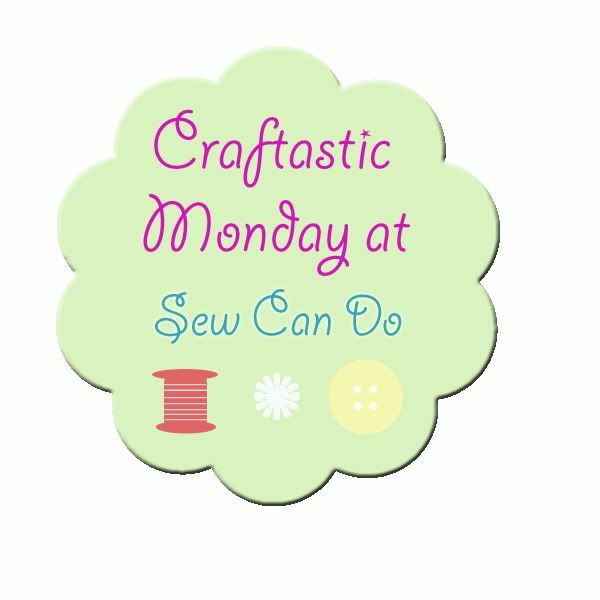 Thank you for stopping by and have fun crafting! Thanks for stopping by to check out the post! I just added you on G+! Have a great day! Good Morning Tiffany, What a fabulous idea and such a good use of using scrap material..... which I have in abundance. My daughters would wear the flower headband, but, being a lady of more senior years, I would wear the flower as a brooch. Thank you so much for the tutorial. Thank you! I love finding ways to get rid of scrap material, before it eats away at my closet. :) The brooch idea sounds lovely. I'm a new follower of yours now on G+. Cute headband! I love that you used denim, and the pearl in the middle is a lovely touch! thanks for sharing at Submarine Sunday! Super cute! Love the addition of denim. Thanks for sharing with Share Your Cup. Love it :) I would wear this if there isn't an age limit lol. Denim, lace and pearls, can't beat that combo. Love how you did the flower, perfect! Thanks for sharing on Snickerdoodle Sunday! Thanks for coming to check out the project! Have a great weekend! Thanks for coming y Oh My Heartsie Girl just Pinned!!! Thanks for pinning!! Have a fun weekend! What a totally fun idea! I too, have many pairs of old jeans hanging out in boxes, just waiting to be used! I love re-using old stuff, love this! Thank you so much for joining us at the Party In Your PJs. link party, we loved having you and we hope you will join us again this week, the party goes live at 7pm tonight! Thanks I'm so glad to hear you like the headband! I'm actually working on a couple more posts about how to reuse denim :) I will definitely join the party tonight! Thanks for stopping by. CONNIE SOWARDS commenting: My daughter has just gotten into headbands and this seems easy enough to make for her. Thanks for the inspiration!